Illinois State University’s Emergency Manager Eric Hodges In the Emergency Operations Center (EOC). It started as an Active Shooter alert followed by a warning to those on the Ohio State University campus to run-hide-fight, if need be. It was over relatively quickly but nine people received injures from a butcher knife or being hit by a car. The attacker, a young man from Somalia was dead, shot by a police officer. Emergency planners are giving approval to the way Ohio State's procedures worked. 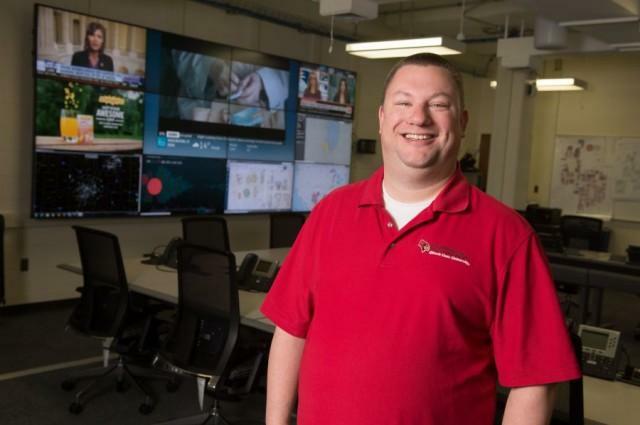 GLT's Charlie Schlenker talked with Illinois State University's Emergency Manager, Eric Hodges, about what plans ISU has in a case like that and what went well in Ohio. Three crimes, which could be labeled as hate crimes, have been reported near Illinois State University since the Presidential election. ISU Police Chief Aaron Woodruff says his department is investigating a report of threats to beat up a transgendered person who was on the quad on Sunday. The Bloomington-Normal Arts Collective is facing recent turmoil on the political scene with a three-day exhibition called Art for a Change.